When we first developed the Metrix 4 Utility Accounting System, our goal was to simplify the process of demonstrating energy savings. By bundling together the ability to correct for weather and up to 3 other independent variables affecting facility energy consumption simultaneously (multi-variable normalization), Metrix achieved this goal. Following on the success of Metrix 4, our team is now proud to announce Option C, the latest in digital energy management solutions. Option C builds upon the strengths of Metrix 4 – retaining what our users valued – while expanding upon these features in a wholly redesigned, sleek interface. Option C also offers a fully integrated report feature, allowing users to shift seamlessly between managing and editing their project and generating reports. Reporting is fast and efficient, and generated reports can be easily exported in a variety of formats. 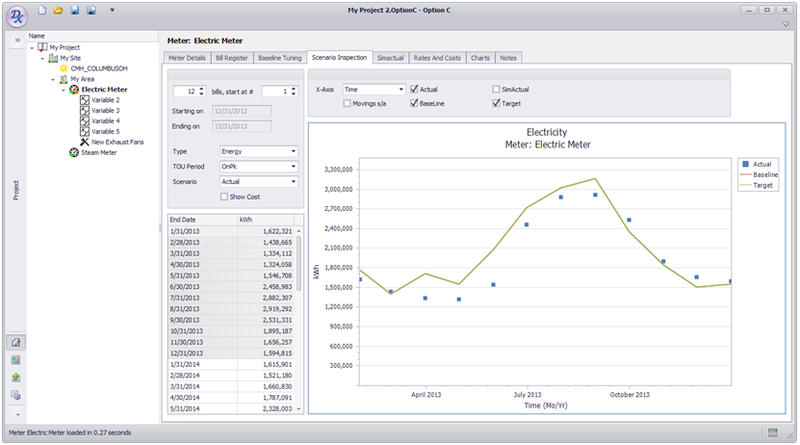 Like Metrix 4, Option C normalizes energy usage for weather and other variables (such as number of cars produced or school calendar), and presents your true energy savings. Variations in weather or productions quantities, occupancy or schedule, which might have masked savings, will no longer compromise energy savings numbers. Metrix has been used by energy service companies for well over a decade to calculate savings from their performance contracts. Hundreds of millions, if not billions of dollars in energy performance guarantees are riding on Metrix. We worked hard to ensure that Metrix was the standard in weather normalization, and we are committed to realizing the same success with Option C.
We are not just utility software makers. We track utility bills for many large organizations. We perform M&V for ESCOs. We perform energy audits, retro-commissioning for ESCOs, the Federal Government and commercial clients all over the United States. We understand energy, energy management, and energy managers.